The Super Street magazine has had a loyal following of car tuning enthusiasts since its inception in 1996. Evidently the publisher felt confident enough to team up with Lion Castle Entertainment to produce Super Street: The Game. Is the result something fans of the magazine should rush to buy? Find out in our Super Street: The Game review. Super Street includes a bare bones introductory race, where the player is taught the controls as they compete in a race of fully tricked-out cars. Performance in this intro race has no bearing on the game; it only serves as a way to familiarize players with the controls. Once that’s over, a starter car is chosen. Super Street’s differentiator is that players are able to begin with a clunker and build it up with custom parts to really make it their own. The main career mode is typical for a racing game. Players earn reputation by placing 3rd or better in events, which will unlock higher class events. Outside of an occasional special event, where the car to be used is specially-made for the event, the player’s starter car is always used. There are twelve events, which have five races apiece. The usual race types are here, such as circuit, time trial, and elimination, plus an attempt at a different mode called Sprint. This is a multi-checkpoint race, where you are tasked with driving through all checkpoints in any order, within a certain amount of time. Problem is, there is no preview of the map you are about to race on, and you have no way of knowing if a checkpoint is above or below you in the distance. Only repeated trial and error will result in achieving first place/gold, which is a frustrating experience. In this career mode, new characters will join the player’s crew once enough reputation points have been earned. All five crew members who end up joining are women with generic backgrounds, and completely unrealistic physical proportions. These “ideal” women also like to walk around the player’s garage, showing plenty of skin, and posing while they work. I suppose these could be stand-ins for the Super Street Girls as shown on the magazine’s website, but contrary to what the game states, other than showing up as eye candy, they don’t appear to help boost the car’s stats. Speaking of stats, upgrading the car is where things begin to break down. Actually, that isn’t really true. Driving is where things truly break down in Super Street. In a racing game, that’s kind of a problem. Ever wish you knew what it felt like to pilot a driverless cardboard box, slathered in butter, in a world as seen through Vaseline-coated glasses? Then this is the game for you! No matter if the starter car or a souped-up special vehicle is chosen, all cars handle essentially the same. The brakes are all but ineffective for slowing down, and even the simplest of turns require heavy use of the e-brake, though naturally using that for too long will cause a spin. All cars are also as brittle as stunt glass—bumping into anything, at any speed, will rip a part right off. There is damage modeling in Super Street, and it certainly looks impressive. However, the damage is only skin-deep—even a flattened car handles the same as when it is undamaged. At higher speeds, my car behaved more like a tank with a ramp attached to its front, as it repeatedly (and hilariously) launched other cars into the stratosphere upon a direct hit, but only sometimes. Other times, I found my car was forced down under opponents, clipped right through the world, and was then sent hurtling into the great abyss that is under all game maps, until the game simply reset the car. Super Street has these clipping issues throughout many of its maps. Since many of its locations are urban, there are houses on some circuits’ paths on both the inside and outside of a turn. But often, taking a turn too wide or too tight won’t matter, as cars repeatedly pass right on through the scenery. In forest-heavy maps, clipping through a guardrail is a guaranteed launch off the course and perhaps into a tree, that is, if the clipping works on those. Poor collision mapping throughout the rest of the environment results in bouncing off of walls, spinning in mid-air, and just generally sliding and bumping around instead of actual racing. All cars have nitro, and reckless driving rewards players by filling up their gauge. Problem is, even going airborne is a massive risk in Super Street. Hit a small bump at the wrong angle, and you’ll be doing barrel rolls that would make Peppy from Starfox proud. There’s no rewards for doing airborne stunts, because the game never intended on you performing these maneuvers! Any 360s you pull off in Super Street are simply the result of wonky physics and poor testing. Back to upgrading. Good performance in events rewards cash and reputation. Cash is used to purchase parts from the in-game garage. For a supposed tuner-centric game, the choices here are disappointingly limited outside of cosmetic items. Parts such as the engine, turbo, ECU, brakes, and a few others can be upgraded. No differential upgrades, or spark plugs, nor even tire tread types to choose from. Bafflingly, except in the engine category, no matter the price paid, all parts add the same stats to the car. So, $400 brakes give the exact same benefits as $1500 brakes. It’s nonsensical, and means that for performance parts, the best strategy is to buy whatever’s cheapest, so you can still have money for cosmetic parts. There is a decent selection of cosmetic parts, including all manner of body parts, steering wheels, trunk layouts, sub-woofers, screens, and more. Lots of paint options are available for the exterior, as well. So, while your ride may drive like a brick, at least it will look nice. It won’t take long to unlock exactly the parts you want, since races are also pretty easy to win. The Unreal Engine powers Super Street, which thankfully manages to hold a steady frame rate while playing. Car models are detailed, though of course not to Project CARS or Gran Turismo levels. Environments are blurry, though, and even checkpoints look fuzzy right up until they are approached. 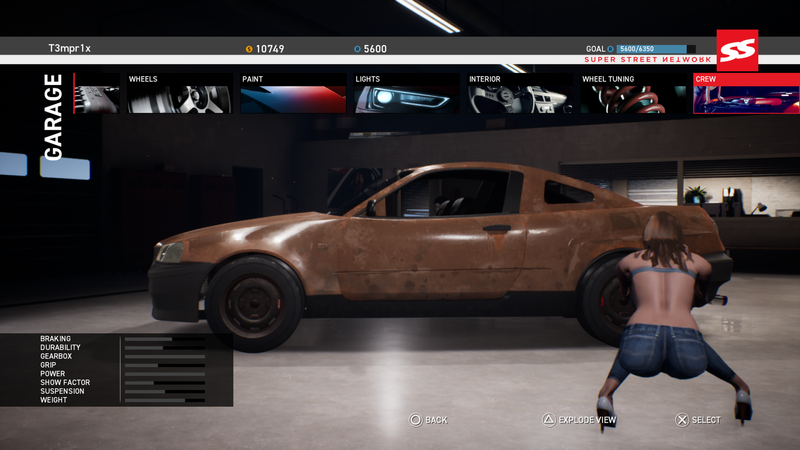 Navigating the upgrade menu of the garage screen does result in significant slowdown, as the game struggles to swap out part models in a decent amount of time. Races do load fairly quickly, though. As should be expected in a game of this caliber, the soundtrack is an entirely generic mishmash of light electronica and nondescript voice samples, and you’ll be hard pressed to hear much of a difference between engine sound effects. Super Street allegedly supports online play. I say allegedly, because only a week after launch, no online opponents could be found. Split-screen support for up to two players is included, with up to five AI opponents. The graphics are noticeably toned down for this mode, so that the frame rate can remain at around 60 FPS. The map selector offers no preview, asking the player to choose one of ten tracks by name alone. Super Street: The Game is a disappointment in all aspects. Clunky driving, a blurry presentation, generic sound design, boring upgrade options, and mind-bogglingly terrible physics all mash together into one “arcade” racer you’re better off avoiding, especially at its launch price of $49.99 USD. Its two saving graces are possessing a decent selection of cosmetic options and split-screen support, but those features do nothing to make this game worthy of a purchase. The game has already been out for over a week, and its online population is nonexistent. The developer has also not issued any sort of patch to fix some of the more glaring issues. If that’s a sign of what to expect when it comes to post-launch support, racing fans should look elsewhere to get their tuning fix. Super Street: The Game review code provided by publisher. Version 1.00 reviewed on a PS4 Pro. For more information on scoring please see our Review Policy here.